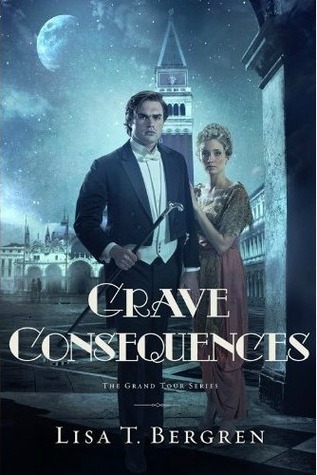 Grave Consequences by Lisa Tawn Bergren is the second book to the Grand Tour Series. The story from Glamorous Illusions continues with the life of the newly wealthy Cora Kensington. She is on the Grand Tour with her newly discovered siblings and experiences the trials of the wealthy. I ordered the first book in this series because I wanted to start at the beginning. I do not recommend that Grave Consequences be read alone, you really should read book one to understand the story. While I enjoyed the first book for the setting up of the story, both have been extremely disappointing. I love this author and I was so excited about this book, but its a book I didn't really want to finish. Yes, there are exciting scenes and funny moments, but the love triangle is completely ridiculous and I don't see that Cora has grown up at all. It's a long drawn out soap opera that is in a perfect setting but the characters and story line did not draw me in. I love the history and beautiful places that the writer includes but the romance could have been left out. That being said, I do love this author and look forward to other books that she writes in the future. "I received this book for free from Litfuse Publicity in exchange for an honest review".